PENTICTON, CANADA—Reporting from the Dominion Radio Astrophysical Observatory here requires old-school techniques: pad and pen. Upon arrival, I must turn off my digital recorder and cellphone and stash them in a shielded room with a Faraday cage—a metal mesh that prevents stray electromagnetic signals from escaping. The point is to keep any interference away from the observatory's newest radio telescope, the Canadian Hydrogen Intensity Mapping Experiment (CHIME). On a clear, cold day in January, Nikola Milutinovic stands on the vertiginous gantry that runs along the focus of one of CHIME's four 100-meter-long, trough-shaped dishes. Milutinovic, a scientific engineer at the University of British Columbia (UBC) in Vancouver, scans their reflective surfaces for snow, which generally sifts through the metallic mesh but sometimes sticks and freezes. Snow-covered hills surround him, shielding CHIME from the cellphone towers, TV transmitters, and even microwave ovens of nearby towns. "If you switched on a cellphone on Mars, CHIME could detect it," he says. CHIME's quarry is neither so faint nor so close. The telescope is smaller and cheaper than other leading radio observatories. 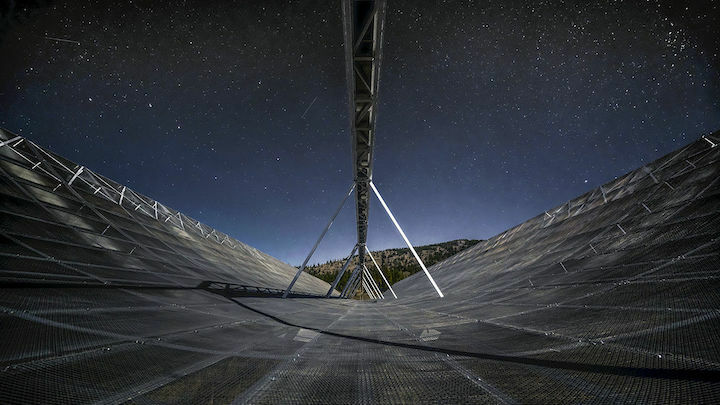 But by luck as much as design, its capabilities are just right for probing what may be the most compelling new mystery in astronomy: signals from the distant universe called fast radio bursts (FRBs). Discovered in 2007, FRBs are so bright that they stick out in the data like a peak in the nearby Canadian Rockies—so long as a telescope is watching and its electronics are fast enough to pick out the pulses, which last only a few thousandths of a second. Just days before I visit, CHIME—still in its shakedown phase—had made global headlines for bagging 13 new FRBs, bringing the total known to more than 60. Nearly that many theories exist for explaining them. One of the few things researchers know for sure, from the nature of the pulses, is that they come from far beyond our Milky Way. But in an instant, each event is over, leaving no afterglow for astronomers to study and frustrating efforts to get a fix on their origin. Whatever generates FRBs must be compact to produce such short pulses, astronomers believe, and extremely powerful to be seen at such great distances. Think neutron stars or black holes or something even more exotic. FRBs can repeat—although strangely, only two of the dozens known appear to do so. The repetition could rule out explosions, mergers, or other one-time cataclysmic events. Or repeating and solitary FRBs could be different animals with different sources—theorists just don't know. What they need are numbers: more events and, most important, more repeaters, which can be traced to a particular environment in a home galaxy. CHIME will deliver that by surveying the sky at high sensitivity. Its troughs don't move, but they observe a swath of sky half a degree wide, stretching from one horizon to the other. As Earth turns, CHIME sweeps across the entire northern sky. Sarah Burke-Spolaor, an astrophysicist at West Virginia University in Morgantown, says its sensitivity and wide field of view will enable it to survey a volume of the universe 500 times bigger than the one surveyed by the Parkes radio telescope in Australia, which discovered the first FRB and 21 others. "CHIME just has access to that all day, every day," she says. Once CHIME's commissioning phase is over later this year, scientists think it could find as many as two dozen FRBs per day. "Within a year, it will be the dominant discoverer of FRBs," says Harvard University astrophysicist Edo Berger. The strange-looking telescope has been a labor of love for the small team behind it—labor being the operative word. A contractor assembled the dishes, lining the troughs with a radio-reflective steel wire mesh. But everything else was painstakingly assembled by researchers from UBC, the University of Toronto, and McGill University in Montreal. That includes 1000 antennas fixed beneath the gantry at each trough's focus, 100 kilometers of cabling, and more than 1000 computer processors that sit inside radiation-shielded shipping containers next to the dishes. "Everyone has put their hands on the telescope," says Milutinovic, who puts in shifts monitoring it and its computer systems. It's not just a desk job. Although he left alone two baby ospreys that nested on a tall pole near the telescope, he has called in conservationists to remove other birds that set up house in the telescope's structure, along with the occasional rattlesnake. When a humidity sensor in one of the computer containers goes off at night, Milutinovic makes the 25-minute drive to the deserted observatory to check it out. He worries about other nocturnal visitors. "I've seen the tracks of coyote, and there's a bear that hangs around here." In a field in which front-rank telescopes cost billions, the CA$20 million CHIME looks set to have an impact out of all proportion to its price tag. "CHIME shows you can build a telescope that makes the world news pretty cheaply," Milutinovic says. None of that was part of CHIME's original job description. Back in 2007, a group of cosmologists in Canada had the idea of building a cheap telescope to measure the 3D distribution across the universe of hydrogen gas clouds, which glow faintly at radio frequencies. The aim, says Keith Vanderlinde of the University of Toronto, was to map ripples in the density of matter created soon after the big bang and chart their expansion over cosmic history. A change in the expansion rate would tell researchers something about dark energy, the mysterious force thought to be accelerating the universe's growth. "Any handle we can get on it would be a huge boon to physics," Vanderlinde says. CHIME would also be an excellent machine for studying pulsars. Pulsars are neutron stars, dense cinders of collapsed giant stars, that shoot electromagnetic beams out of their poles while rotating like a celestial lighthouse, sometimes thousands of times per second. Astronomers on Earth detect the beams as metronomic pulses of radio waves. CHIME will monitor 10 pulsars at a time, 24 hours a day, for hiccups in their perfect timekeeping that could result when passing gravitational waves stretch intervening space. When CHIME was conceived, few people were thinking about FRBs because the first, found in 2007 in archival Parkes telescope data, was such an enigma. It had a high dispersion measure, meaning the pulse was smeared across frequencies because free electrons in intergalactic space had slowed the burst's low-frequency radio waves disproportionately. The high dispersion measure suggested the burst came from billions of light-years away, far beyond our local group of galaxies. The pulse was still bright, implying the source's energy was a billion times that of a pulsar pulse. Yet its short duration meant the source could be no bigger than 3000 kilometers across because signals could not cross a larger object fast enough for it to act in unison and produce a single, short pulse. A citysize pulsar could fit in that space. But how could a pulsar detonate so powerfully? Astronomers were tempted to dismiss that first burst as a mirage. But it was no anomaly: Another pulse was uncovered in Parkes archival data in 2012. Then, after an upgrade with new digital instruments, Parkes detected four more in 2013, all with high dispersion measures, suggesting cosmically distant origins. That paper "made me a believer," says McGill astronomer Victoria Kaspi, who was working to integrate pulsar monitoring into CHIME. The paper also sparked a realization: CHIME could be adapted to look for FRBs, too. "Vicky called me up and said, ‘You know, this would also make a good FRB machine,’" recalls Ingrid Stairs, a collaborator of Kaspi's at UBC. The upgrade was not easy. Catching FRBs requires finer time and frequency resolution than mapping hydrogen. CHIME's data would have to be logged every millisecond across 16,000 frequency channels, Kaspi says. To do that meant tinkering with the correlator, the fearsomely parallel computer that chomps through the 13 terabits of data streaming every second from CHIME's 1024 antennas—comparable to global cellphone traffic. The time-critical astrophysicists needed a different output from the sensitivity-is-everything cosmologists. The cosmologists, eager to map the cosmic clouds, could get by without the extra resolution. At the end of each day, they could download data onto a hard disk and ship it to UBC for leisurely processing. But that wasn't an option for the FRB hunters, who needed high-resolution data that would quickly overwhelm a hard drive. Kaspi and her colleagues devised algorithms to scan in real time just a few minutes of high-resolution data stored in a buffer. If an event is detected, the key 20 seconds of data around it are saved. If there's nothing, they're dumped. Searching for FRBs is "smash and grab science," says team member Paul Scholz of the Dominion Radio Astrophysical Observatory in Okanagan Falls. As test observations began in 2017, the team got twitchy about how many FRBs CHIME would see. CHIME was observing at frequencies of 400 to 800 megahertz (MHz), lower than the 1.4-gigahertz frequency used to detect most FRBs. A 300-MHz survey at a different telescope had found nothing, and another survey at 700 to 800 MHz saw just a single burst. "It was worrying, especially in the lower part of the band," Stairs says. Those worries evaporated in July and August 2018, when the team struck gold with the 13 new FRBs, even though sections of the telescope were sporadically taken offline for adjustments. The haul, published in Nature in January, included one repeater—only the second yet discovered. Kaspi declined to provide an update on the number of FRB discoveries since last summer, citing two unpublished papers in the works. But she says CHIME is "fulfilling expectations." "It's a bit like drinking from a firehose, but in a good way," she says. Theorists want all that CHIME will deliver, and then some. A poverty of information is allowing ideas to run riot. "Almost every aspect of FRBs is in play for theorists," Berger says. An online catalog of FRB origin theories had 48 entries at the time of writing. Many theorists initially put forward models based on the violent collapse or merger of compact objects, including white dwarfs, neutron stars, pulsars, and black holes. But the discovery of repeaters shifted speculation to sources that would not be destroyed in the act of generating a burst. Active galactic nuclei, the supermassive black holes at the centers of galaxies, spew winds and radiation that might trigger a burst by striking nearby objects—a gas cloud, a small black hole, or a hypothetical quark star. Or the bursts might come from more speculative phenomena, such as lightning strikes in the atmospheres of neutron stars or the interaction of hypothetical dark matter particles called axions with black holes or neutron stars. Amanda Weltman, a theorist at the University of Cape Town in South Africa, does not discount even more fanciful ideas such as cosmic strings, hypothetical threadlike defects in the vacuum of space leftover from the moments after the big bang. They "could be releasing fast radio bursts in a number of ways," she says. But as the number of detected FRBs moved from single digits into dozens, astronomers realized the bursts could be downright common, detectable by the thousands every day if the right telescopes were watching. "That's a serious problem for a lot of models," Berger says. FRB 121102, the first repeating event detected, may be the most revealing FRB so far. The Arecibo telescope in Puerto Rico saw its first burst in 2012, but since then dozens more have been seen coming from that spot on the sky. In 2017, the 27-dish Karl G. Jansky Very Large Array in New Mexico revealed the FRB resides in the outskirts of a distant dwarf galaxy and that the location coincides with a weak but persistent radio source. That dim radio glow may emanate from a supernova remnant—an expanding ball of gas from a stellar explosion, which could have formed a black hole or neutron star that powers the FRB. In another clue, the polarization of the FRB's radio waves rotates rapidly, suggesting they emanate from a strong magnetic environment. Almost every aspect of [fast radio bursts] is in play for theorists. Brian Metzger, a theorist at Columbia University, believes a young magnetar—a highly magnetized neutron star—resides at the center of the cloud and powers the bursts. In a scenario developed with his colleagues, its magnetic field serves as a fizzy store of energy that occasionally flares, blasting out a shell of electrons and ions at nearly the speed of light—an outburst resembling a coronal mass ejection from our sun, but on steroids. When the flare hits ion clouds leftover from previous flares, the resulting shock wave boosts the strength of the clouds' magnetic field lines and causes electrons to spiral around them in concert. Just as synchrotrons on Earth whip electrons around racetracks to emit useful x-rays, those gyrations spawn a coherent pulse of radio waves. Magnetars are often invoked to explain such energetic events, Metzger says. "They're a catch-all for anything we don't understand. But here it's kind of warranted." CHIME team member Shriharsh Tendulkar of McGill wonders whether objects such as magnetars could explain both repeaters and single-burst FRBs. Single-burst FRBs might "start out regular as repeaters, then slow as [the source's] magnetic field weakens," he says. But according to Weltman, it's too early to declare the mystery solved. "There are so many clues here, but they do not yet point to a single conclusive theoretical explanation," she says. As observers amass new FRBs, different classes of events may emerge, perhaps offering clues about what triggers them. FRBs may also turn out to come from specific types of galaxies—or regions within galaxies—which could allow theorists to distinguish between active galactic nuclei and other compact objects as the sources. "We need statistics and we need context," Metzger says. In the coming years, other FRB spotters will come online, including the Hydrogen Intensity and Realtime Analysis eXperiment in South Africa and the Deep Synoptic Array in California. With their widely spaced arrays of dishes, both facilities will precisely locate FRBs on the sky—something CHIME can't do for now. "They're all going for localization because they know CHIME will clean up on statistics," Scholz says. The CHIME team, not to be outdone, is drawing up a proposal to add outriggers, smaller troughs at distances of hundreds of kilometers, which will record the same events from a different angle and so help researchers pinpoint them. "With all these new efforts, there'll be substantial progress in the next few years," Metzger says. For now, as CHIME's commissioning phase winds down, Milutinovic's job is to ensure that it keeps doing its job. "You want it to be boring," he says. "It's the weather that gives us most issues"—snow on the troughs, summer heat waves that tax the cooling system for the electronics. Then there's the grass, a wildfire risk. Every summer, the observatory invites ranchers to graze their cattle on-site—not only to be neighborly, but also because cows emit less radio frequency interference than a lawn mower. But they can't graze right around CHIME because they might chew on cables. So Milutinovic relies on diesel-powered mowers, which, lacking spark plugs, pose less of an interference problem. But he longs for an even better high-resolution grass-cutting tool. "We thought of having a CHIME goat."